While questing through Gorgrond for the second time in the WoD Beta, I decided even though I'd already done that portion, I really wanted to go do Rexxar's quests again. He's easily one of my favorite characters in the game. 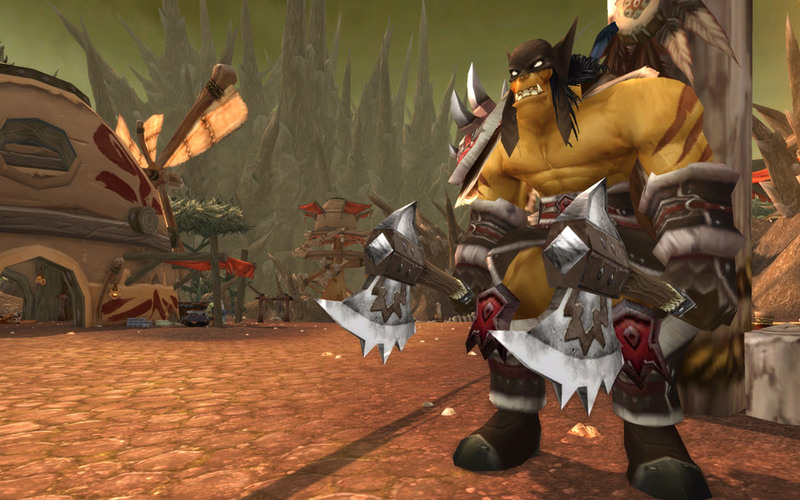 When WoD was first announced at Blizzcon last year, my biggest dream for the expansion was that they would announce Mok'Nathal as a new playable race, and to go along with it, an aspect that would allow BM or SV hunters to use modified melee versions of their abilities with melee weapons. That, is obviously not going to happen, but a hunter can dream, right? Let's take a second to talk about why Rexxar would be such an amazing archetype. First of all, there's the outfit. Hunters do not need mail, especially when we're shooting a bow or gun, but even when we're in melee. A single shoulder guard to take arrows, or deflect a silly warrior who tries to leap at us, that's enough armor. We most certainly don't need an ornate helm; a nice bandanna to keep the hair out of our eyes, totally acceptable, but no need at all for the helms they've been giving us. My final point about his outfit (and then I promise to stop talking about clothes) is why do only the ladies get to go around wearing almost nothing? It's hot out, and sometimes I just want to take my shirt off, damn it. The next, and I think most important, reason I want to see Rexxar as the hunter archetype, is while he has some allegiance to faction, his first loyalty remains to his animal companions, and to the wilderness. Even if he comes to the aid of the horde in their times of need, he can't remain cooped up in a city, he's got to get back to the wilderness. In Warcraft II he explained to Thrall: "I am Mok'Nathal--a wanderer. I belong in the wilds, amidst the beasts and elements of the land." Rexxar's allegiance to the beasts of the wild is further exemplified in Warlords of Draenor's Rexxar, when you have an opportunity to save his bird, and in doing so get to team up with him to take on some of the clans of the Iron Horde together. You also, as someone he respects, get to decide if one of your compatriots under your command get to live or die. Though actually you can't go forward with anything if you let Rexxar kill them. Still, it's an interesting dynamic, and definitely fun to see. The point of all this is, Rexxar is a skilled melee hunter, duel wielding axes, and it's freaking awesome. I really like the way it looks and feels, and while I wouldn't necessarily want to play melee hunter in a raid (cause melee is kind of silly in raids anyway, other than the tank), but it would be fun to level or do some soloing as melee. It wouldn't have to be a huge design change for hunters, just add a stance type ability which lets you use your core rotational abilities as "strikes" instead of "shots". Cobra Strike, Arcane Strike, Explosive Strike (ok, that one doesn't make a lot of sense). It would be significantly different from Rogues, Kitties or Monks, mostly in that you're still rebuilding your resource the same way all hunters do, and there would be no combo points of any sort. Just like with Lone Wolf, where you can't use abilities that require you to have a pet, this could have similar limitations, other than converting core rotational abilities to melee abilities, you wouldn't be able to launch traps, only set them, and it wouldn't have to convert talents like binding shot. Even though it's not a real, viable way to play well, there are a few hunters out there having fun with Melee. Pypo has a video of a random BG where he plays a Melee BM Cow. And most people who follow hunters will remember the Melee Hunter vs Dark Shamans video that made the rounds back in March. Part of me likes that it's not really something blizzard helps with, but hunters just make it happen. Still, I wouldn't mind at all if we one day received a melee option.